Celtic boss Brendan Rodgers thinks that bringing in better players is the simple answer to Steven Gerrard's early success at Rangers. The former Liverpool and England captain, who worked under Rodgers at Anfield, is unbeaten in 12 games since he took over at Ibrox in the summer and has taken the Light Blues into the group stages of the Europa League, where they have been joined by the Parkhead men. Gerrard will experience an Old Firm game for the first time as Gers boss when he takes his side to Celtic Park tomorrow. 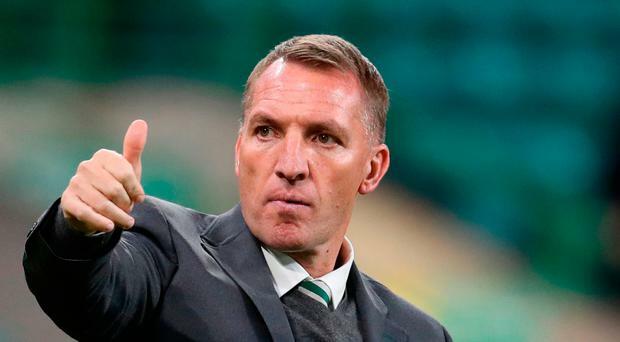 Ulsterman Rodgers, unbeaten in 11 fixtures against the Govan men since he took over in 2016, simplified the reasons behind Rangers' resurgence. He said: "There is no doubt that looking at them and analysing them, Steven has done a very good job. "He has pulled together a lot of players and they are clear in how they work. What is key is that they have brought in some good players. Players at a higher level which has allowed them to work in a better way. "He has had a very good pre-season but it is not so much the manager and who are you are up against, whether it is Graeme Murty or Mark (Warburton) or Pedro (Caixinha), it doesn't matter. "It is really about the players on the field and you try to organise your team to play against the opponent. "For us, it is a great game to finish this phase of games. We have had two really good results at home. "We always said we would like to finish this first phase of the season with three home wins and that will be the focus." Meanwhile, Gerrard will use a surprise airport welcome as inspiration for his team when he takes his players into an even more hostile Celtic Park than normal. There will only be about 800 visiting fans at Parkhead tomorrow after the Ladbrokes Premiership champions reciprocated Rangers' decision to slash the number of away fans by about 90 per cent. But Gerrard will tell his players to make the Rangers fans watching on television proud after being wowed by a noisy reception when they landed at Glasgow Airport in the early hours of Friday after booking their place in the Europa League group stages in Russia, drawing 1-1 away to Ufa to progress 2-1 on aggregate. "Of course we would like more support there, that goes without saying, but what we do know is we'll have support all around the world," Gerrard said after their arrival back in Scotland. "We landed at 1.30 in the morning and there were thousands of people there ready to get behind the team and support the team. The support is incredible here," he added. "Even though we won't have big numbers in the stadium, the players will be well aware that we'll be getting support from all over the place. "The idea will be to get a result that makes them proud."